Holistic community partnerships present an opportunity to strengthen the overall resilience of a community and improve public health. Multisector investment in community resilience across neighborhoods will reimagine how neighborhoods should function day to day, but especially during an event or crisis. Multisector resilience strategies can build or strengthen community readiness. At the same time, strategies must also be cognizant of incorporating existing resilience and community networks that might be valuable assets to improving resilience. After reviewing lessons learned from the uprising during the Freddie Gray protest and the aftermath of some extreme east coast weather events, like Hurricane Sandy; Baltimore City government started an initiative to develop. These hubs would partner with government agencies and other local stakeholders to collect and distribute real-time information needed to make decisions, serve as a staging place for first responders, serve as an emergency center for residents providing food, water, and shelter, among other things. These hubs would not just be active during emergencies. Resilient communities are prepared communities. These hubs help communities prepare for, respond to, and recover from harmful man-made and natural events. For over 30 years, The Door has been rebuilding Baltimore neighborhoods by transforming the lives of residents and creating opportunities for youth to succeed socially and academically. 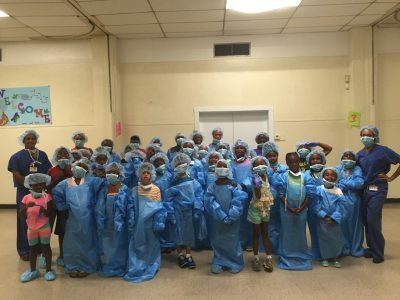 The Door is excited about its Johns Hopkins Community Partnership initiative which employs doctors, nurses and other health professionals to interact with youth from the Door’s programs.